Oversized and knitted cardigans and sweaters are my jam during the cold-weather months. They’re just so cozy, easy to layer with, and effortless. Oh and comfortable too! I’ve been pinteresting non-stop for oversized cardigan outfit inspiration. Who doesn’t love a good cozy knit look?! This past weekend the weather in Chicago took a quick turn. It went from 70 to 40 degrees (plus brutal wind chills) in a matter of 24 hours. It was definitely harsh. I purposely selected this long cardigan from Zaful knowing that it will come in handy during the Winter. So when the weather 180-ed on us, I busted it out. Not going to lie, the wind made it difficult to take these photos! What I love about this cardigan is the length and loose fit. The loose fit makes it easy to layer anything underneath it without feeling constricted. Because let’s be honest, as much as we all love the layered look, layering can be a pain. The long length is so trendy right now and adds that coziness feel to it. To keep myself warm, a plaid scarf is a must! I own a ton of plaid scarves, but they are just so useful and cute! Zaful has an amazing collection of blanket scarves and oversized scarves for under $10. They’re definitely worth checking out! P.S. Don’t forget to enter to win a pair of Christian Louboutin heels, $1000 Nordstrom gift card, or $1000 gift card! Love this cardigan! Cool look! The cardigan and the scarf look so comfy! I am all about the cozy cardi and I love the length of this one! And such a cute blanket scarf! Happy Monday Rach! You're looking great girl! The cardi is lovely. Rach, I love your cozy sweater! Looks SO warm and comfy, and just in time for the chills of Chicago. I was at the Christkindlmarket in the city yesterday and it was indeed… FREEZING! I hope you're doing good girly!! Thanks so much Amber! I know I'm not ready for this weather! Hope you are doing good as well! Cute outfit! That cardigan looks so cozy! This look so warm! NEED! I love how simply you style all of your outfit. It is amazing. This oversized cardigan looks absolutely fabulous on you and I really feel that the oversized cut and color as well as the texture makes this look so cozy and perfect for fall. My favorite way to wear a chunky cardigan. (; When you can pull off oversized in the office, you know you're slaying fashion. LOVE this Rach! Haha you are so funny! Chunky cardigans are seriously the best!! The coziest thing in the fall/winter. Along with sweater dresses of course. 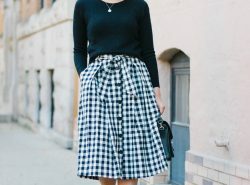 This outfit is so chic and gorgeous for fall, I am so in love with it! You know how much I love when you layer! Totally need your scarf and long cardigan in my life. 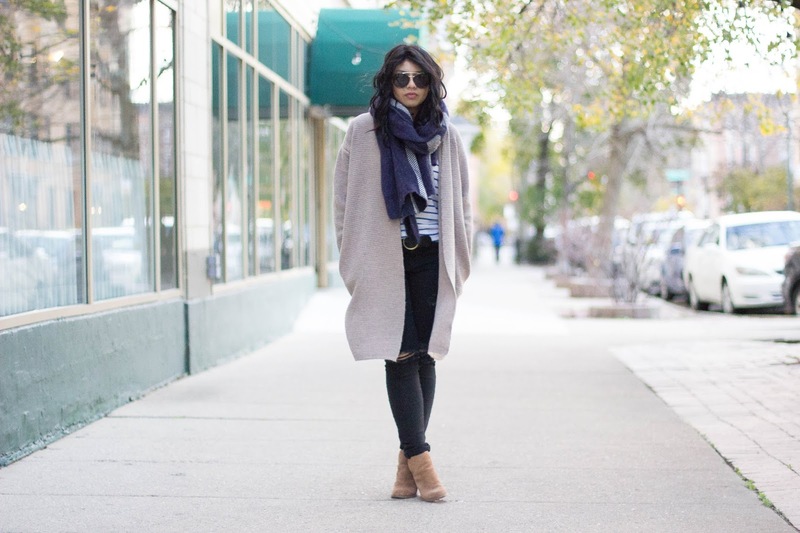 You look so cozy and you layer like a total pro! I love the colour of this cardigan – it's so luxe. I am loving that scarf!! I love your oversized cardi!It is elegant and so pretty on you! This outfit is such a hit! I love it! Perfect for the weather that will be coming our way too. This cardigan is everything, Rach! You look so cozy and chic! I love it and YOU! An oversized cardi is my fall and winter wardrobe staple! It's so cozy and warm. I love yours and how you styled it! Have a great week babe! Thanks Rina! Have a good one too! That's such a cute cardigan and I love how the whole look came together. And ughhhh the wind is the worst when trying to shoot photos! Thanks so much Jackie! It really is the worse! I'm so in love with this cozy look, Rach! Especially the sweater. Coincidentally, I'm also wearing a long cardigan from Zaful in my recent post! Thanks so much Tania! That is awesome and can't wait to see yours! Your cardigan is gorgeous Rach, I like the color. You look great in it. I like the scarf too. Love the cardigan on you! That scarf added the perfect cool vibe! Great look! KC took a hit temp-wise, too! It not definitely feels like fall. LOVE this coat, lady! LOVE this outfit! Oversized sweaters and cardigans are the best! this whole look looks so cozy! You look so fabulous! 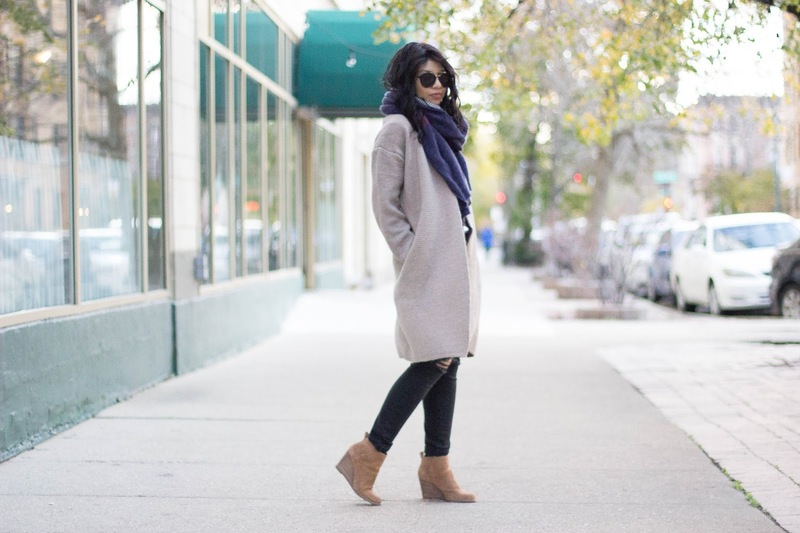 Such great layering and so perfect for this cold Chicago weather! I hope you have a wonderful thanksgiving! Thanks so much Jennifer! Hope you are staying warm! The epitome of cozy-chic!! Absolutely darling my friend!! love the scarf and boots, Rach! great classic pieces, love it! Love it, it is such a beautiful cardigan dear! Oversized cardigans are my favourite and I love the way you styled this one!! Those sunnies look stunning on you and that scarf looks so cozy!! Gorgeous look! Aren't they the best?! So comfy! Thanks Esther! Love that cardigan, you look so cozy and warm!! Love it!! Hope you are doing well!! wow such an amazing look! !